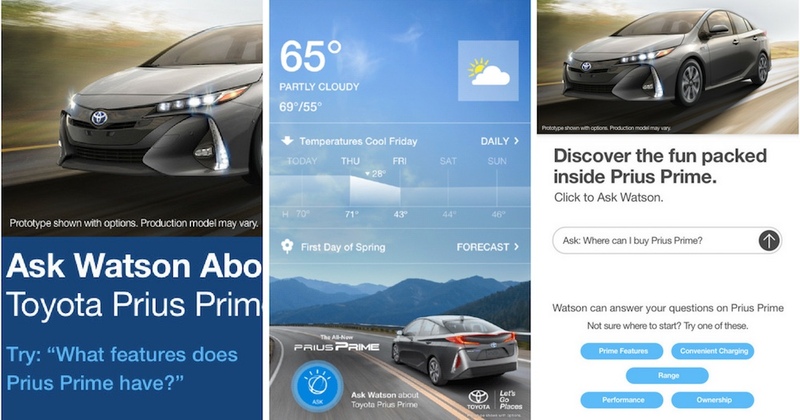 Toyota launched unique advertisements for their new vehicle, the Prius Prime, on The Weather Channel app and weather.com. These advertisements connect to machine learning AI platform IBM Watson and allow a customer to have a two-way conversation with the ads about the product. When a customer taps on the ad, they can ask a direct question about the new Prius Prime and receive an answer from Watson. To prep Watson for its role in the ads, Toyota and IBM fed it knowledge about specific questions normally asked about the Prius Prime and the shopping behaviors of Toyota customers. If the advertisement gets asked an off-topic question, about the weather or something else, it redirects the conversation back to the Prius Prime while attempting to humanize the experience. The ads will continue to run until the third business quarter.